Regular season coverage will begin on MLB Opening Day, Thursday, March 28, against the Philadelphia Phillies on FOX Sports Southeast, with a special one-hour Braves LIVE pregame show at 2:00 p.m. ET. ATLANTA — FOX Sports South and FOX Sports Southeast, exclusive regional broadcasters of the Atlanta Braves, are scheduled to televise 154 Braves games during the 2019 Major League Baseball regular season. Braves LIVE, the networks’ flagship pre- and postgame show for every telecast, will have expanded coverage throughout the season with 45-minute pregame shows for the majority of home games, live from the FOX Sports set at The Battery Atlanta. The complete television schedule is attached and can also be found here. Regular season coverage will begin on MLB Opening Day, Thursday, March 28, against the Philadelphia Phillies on FOX Sports Southeast, with a special one-hour Braves LIVE pregame show at 2:00 p.m. ET. 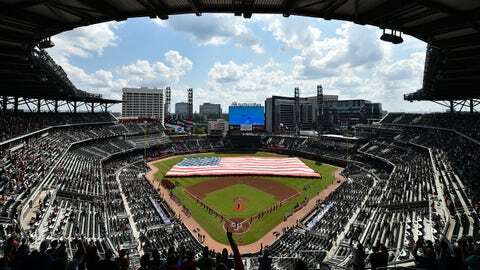 The Braves home opener telecast on Monday, April 1, against the Chicago Cubs on FOX Sports South will also be preceded by a one-hour Braves LIVE pregame show at 6:00 p.m. ET. Local channel listings can be found here. • Emmy® Award winner Chip Caray (16th season) will serve as play-by-play announcer. • Former Braves outfielder and Gold Glove winner Jeff Francoeur (third season) will be the lead in-booth analyst. • Former Braves All-Star, Cy Young winner and National Baseball Hall of Famer Tom Glavine (eighth season) will have an increased presence as an in-booth analyst. • 2018 Braves Hall of Famer Joe Simpson (28th season) will serve as in-booth analyst for select games. • Former All-Star Paul Byrd (seventh season) will serve as an in-game reporter. • Kelsey Wingert (fourth season) will serve as an in-game reporter and Braves LIVE host. • Emmy® Award winner Jerome Jurenovich (13th season) will serve as lead host for Braves LIVE. • Former Braves outfielder and All-Star Brian Jordan (13th season) will serve as an analyst for Braves LIVE. • Former Braves infielder Nick Green (fifth season) will serve as an analyst for Braves LIVE. • Ashley ShahAhmadi (second season) will return as a digital reporter. • Behind the Grind – Presented by Mizuno, this player-focused series will include training demonstrations, warm-up routines, profiles and exclusive baseball tips from Braves players and FOX Sports broadcasters. • DRIVEN – Toyota will present this feature series that provides an in-depth look into Braves players, coaches and team executives. • Hidden Gems – Presented by Mizuno, Hidden Gems will open up the FOX Sports footage vault of some of the most memorable Braves features, outtakes and iconic moments from over 30 years of coverage. • Big League Heroes – These features will explore the people who inspired big leaguers, FOX Sports broadcasters and club executives to achieve their goals and those who continue to inspire them. In addition to the networks’ 154 telecasts, 8 Braves games are currently slated for national TV coverage: Sunday, March 31 at Philadelphia (ESPN); Sunday, April 14 vs New York Mets (ESPN); Sunday, April 21 at Cleveland (ESPN); Saturday, May 18 vs Milwaukee (FOX); Saturday, May 25 at St. Louis (FOX); Sunday, May 26 at St. Louis (ESPN2); Saturday, June 22 at Washington (FOX); Sunday June 30 at New York Mets (ESPN). Every Braves game televised on the networks can be streamed live via the free FOX Sports GO app for all subscribers of participating video providers. For more information, visit FOXSportsGO.com. Extensive Braves coverage from the networks is also available on Facebook, Instagram and Twitter. The FOX Sports regional networks serving the Southeast – FOX Sports South and FOX Sports Southeast – are exclusive regional broadcasters of the Atlanta Braves, televising 154 games during the 2019 MLB regular season to 9 million households across Alabama, Georgia, Mississippi, North Carolina, South Carolina and Tennessee.